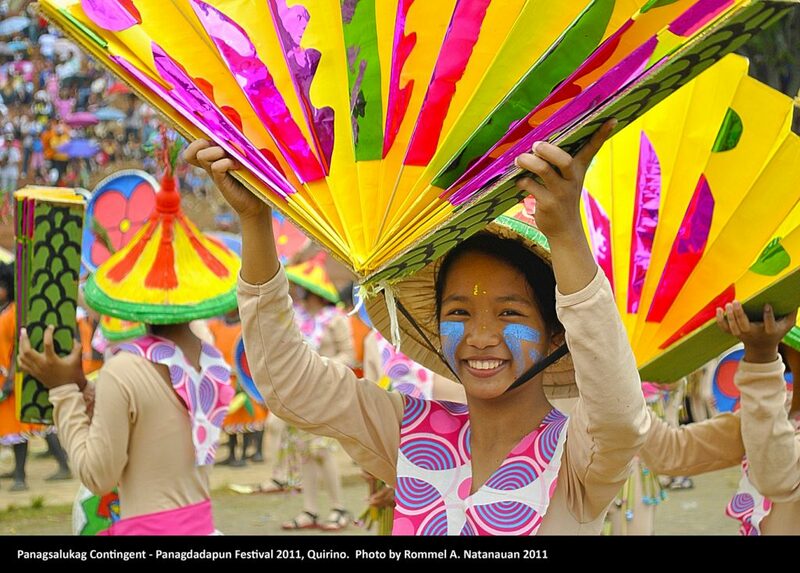 Quirino Province lies in the southeastern portion of Cagayan Valley Region within the upper Cagayan River Basin. Isabela bounds it on the north, Aurora on the east and southeast and Nueva Vizcaya on the west and southwest. The Sierra Madre Mountain Range provides a natural barrier on the eastern and southern border and the Mamparang Range on the western part of the province. It has a total land area of 3,057 square kilometers, which is approximately 8.4 percent of the regional area, and 1.02 percent of the total land area of the country. Quirino Province acquired its juridical personality as a result of the division of the province of the Nueva Vizcaya and Isabela on June 18, 1966 under R.A. 4734. 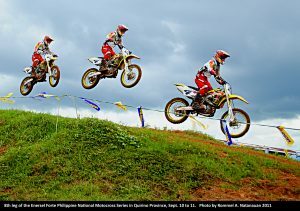 It was named in honor of the then President Elpidio A. Quirino. The province of Quirino was formally established on February 10, 1971 upon assumption to office of the first elected provincial and municipal officials headed by Dionisio A. Sarandi as Provincial Governor. Eventually, on February 25,1983, Batas Pambansa Blg. 345 was enacted, creating the municipality of Nagtipunan, a division of the Municipality of Maddela. Part of the province’s comparative advantage is its accessibility to Aurora (Region 4), which makes it a viable entry/exit through the coastal area of Aurora. Long before its creation, Quirino was the forest region of the Province of Nueva Vizcaya inhabited by tribal groups popularly known as the Negrito or Pugots. These tribal groups roamed the hinterland and built their huts in the heart of the jungle area. Ilocano dialect is widely used in the lowlands of the various municipalities while Ifugao is the predominant dialect in the upland parts. Land transportation is the only available mode of transport to the province. The main artery of transportation that traverses the province is the national road from Cordon, Isabela to Dipaculao, Aurora and Santiago City to Maddela via Jones and San Agustin, Isabela. Transportation facilities in the province include PU jeepney, buses, outrigger banca and tricycles. Maddela-Metro Manila route and vice-versa is served daily by air-conditioned bus lines particularly Nelbusco. Other buses going to Tuguegarao City pass by Cordon and Santiago City where vans are available for the short trip to Quirino. 01. NAGBUKEL CAVE at Diffun, Quirino is perfect for retreats. 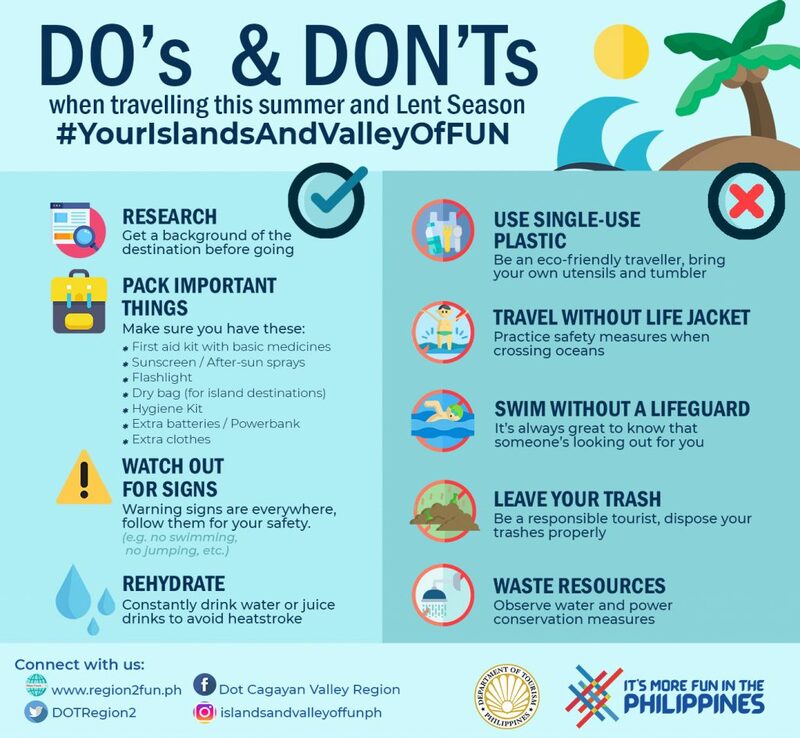 Local tourists usually visit during the holy week for picnic, hiking, and communing with nature. The place is being maintained and developed by the Lamplighter, a religious sect, the cave is four kilometers away from the capital town. 02. AGLIPAY CAVES AND CAMPSITE promises a special venue for communing with nature. 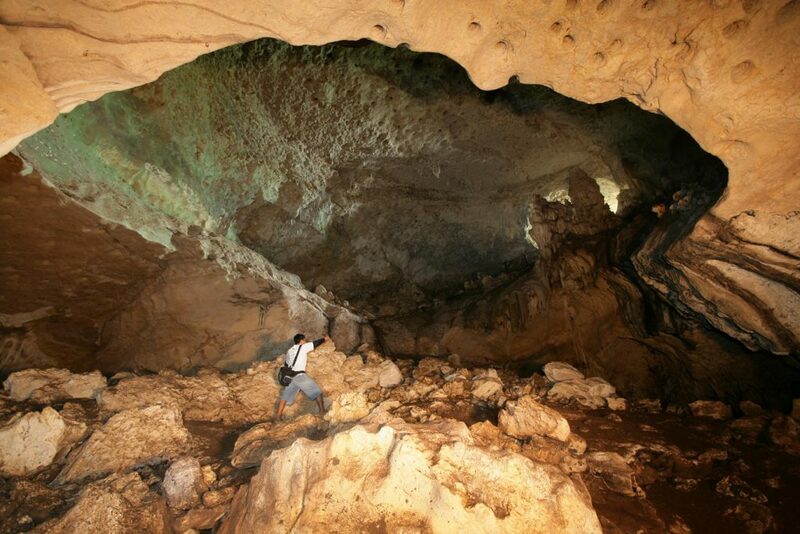 A series of 38 caves, seven of which have been developed as tourist spots. 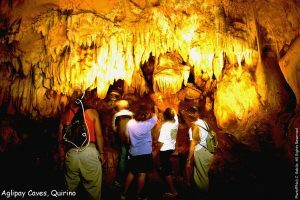 Located in the midst of rolling hills and verdant forest, the caves boast of peculiar characteristics of their own such as an underground spring and well-preserved stalagmites and stalactites. The caves interlink with each other and run to a depth of about 20 meters. The place is recommended for camping activities and outdoor functions especially for big groups. 03. 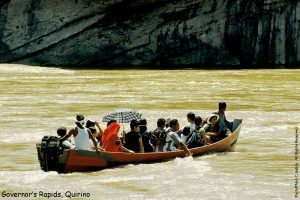 GOVERNOR RAPIDS is famous for its gigantic perpendicular walls of limestone jutting out from one side of the Cagayan River framing the Sierra Madre Mountain and its swift turbulent deep blue waters is perfect venue for kayaking, white river rafting, swimming and fishing. The riverside offers a suitable picnic ground with a magnificent view of the river. This part of the region is also home to Agtas or Negritos. 04. AGLIPAY TOWN is a historic town having patterned its name from Fr. Gregorio Aglipay, a Philippine Independent Church priest who rebelled against the Spanish Colonizers in his time and settled at the banks of Addalam River in Aglipay. 05. NAGTIPUNAN TOWN is the home of lush virgin forests and is being developed as a gateway to Quezon Province through Barangay Sangbay. 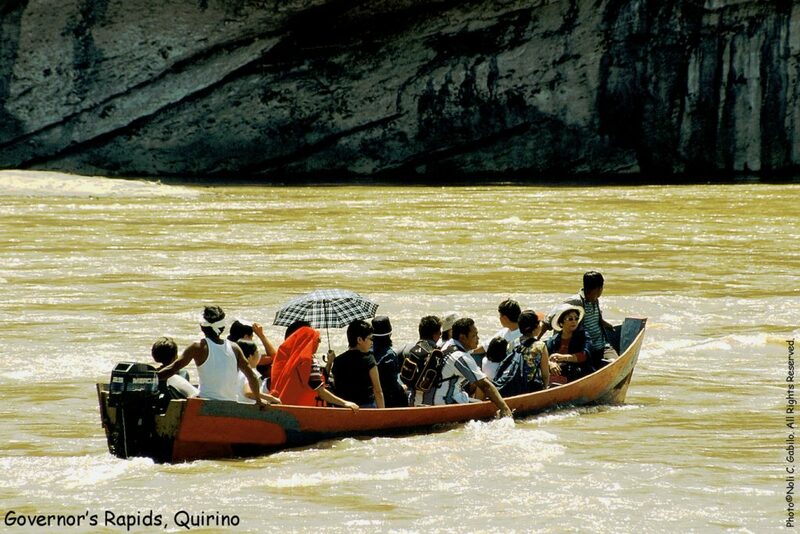 About 54 kilometers from Cabarroguis, the town is a recommended venue for camping and eco-tourism activities. It is also home to the famous rock formation called Bimmapor, a rock formation similar to a ship’s stern which is about to sink. The area is recommended for rock climbing trekking, swimming, rafting, excursion and fishing, among others. It is a few minutes drive from the Municipal Hall where overnight accommodation is available. 07. MACTOL FALLS/SAN PUGO FALLS. This towering falls about 50 meters high spills into a shimmering basin about twenty-two meters deep. All who can appreciate nature in its untouched and raw form should make the trip to Mactol Falls. It is located at San Pugo, Nagtipunan. 08.VICTORIA FALLS and ADDALAM RIVER & NATURE’S PARK in Aglipay offers a sanctuary for nature lovers who wish to enjoy unspoiled environment and adventure. Trek to the Victoria Waterfalls takes about an hour over farms and forestland. 09. MADDELA WATERFALLS AND FORESTS RESORT is a seven-staged waterfall. Short trek to reach the falls and have an excellent nature retreat and relaxation, its crystal pools are favorite swimming and picnic area for tourists.